[post_ads]Walnut the white-naped crane isn’t like all the other girls. She and Chris Crowe, her beloved zookeeper with the avian-inspired name (we really can’t make this up!) have been domestic partners for 14 years and they’re still going strong. Note: That’s much, much longer than many celebrity marriages. 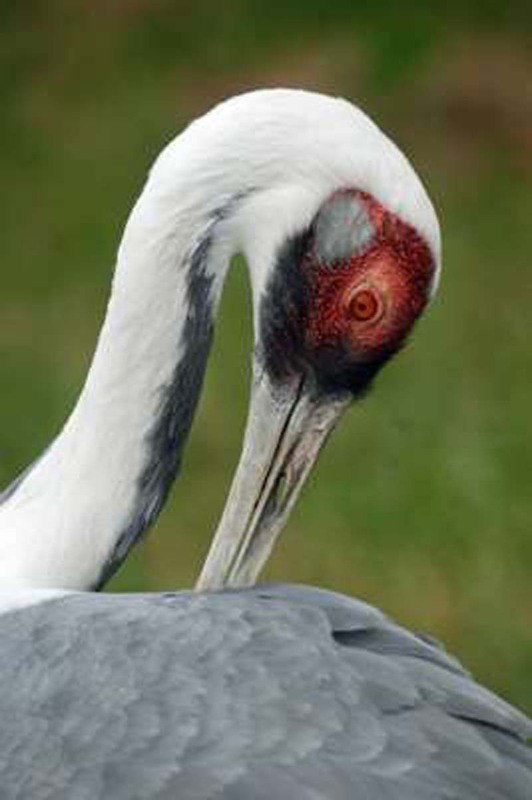 Recently, a Washington Post article about the unusual couple at the Smithsonian National Zoo and Conservation Biology Institute piqued our interest in the rare bird, who, unlike most of the squeaky clean female Bachelorette contestants, has a bad reputation: Walnut is rumored to have killed not one, but two male crane suitors in the past. Like many birds, cranes mate for life, and Walnut — thought to have initially imprinted upon a human who hand-raised her as chick— has fallen hard for the soft-spoken zookeeper who was hired over a decade ago by the Smithsonian to care for her (and other zoo birds). And, according to research, birds who fall in love usually have more reproductive success. The pair’s differences might seem to initially inhibit baby-making, but read on before you pass judgment. “We both came here the same year, 2004,” says Crowe. “She was here a month before I was. 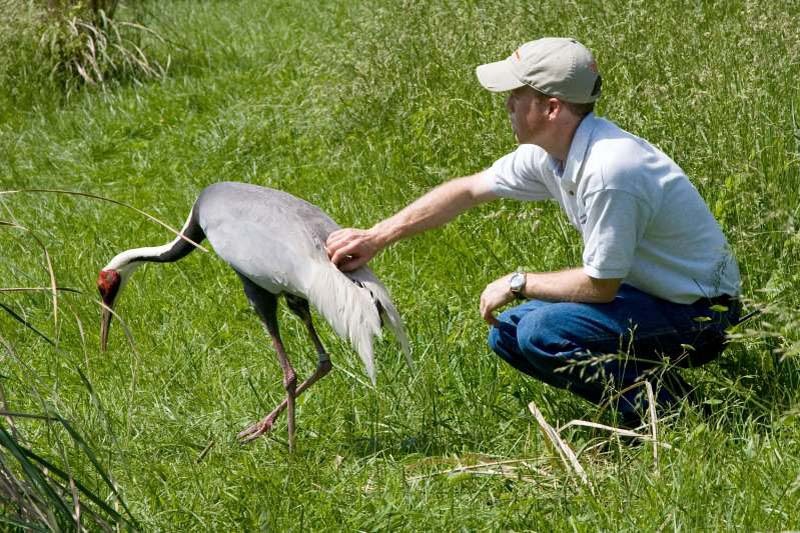 I was assigned to be the primary crane keeper, five out of every seven days … I would take care of her every day, five days a week.” His prior work experience with whooping cranes helped him get the position, but according to Crowe, Walnut took a while to warm up to him. Eventually, Walnut stopped acting territorial and quit threatening Crowe, but he still couldn’t get too close to her — maybe only within a few feet. “It took a while before I could train her to stand still and let me do the artificial insemination technique, says Crowe. Yes, you read that right: the 42-year-old zookeeper has helped to facilitate the birth of seven chicks with the 37-year-old endangered bird. 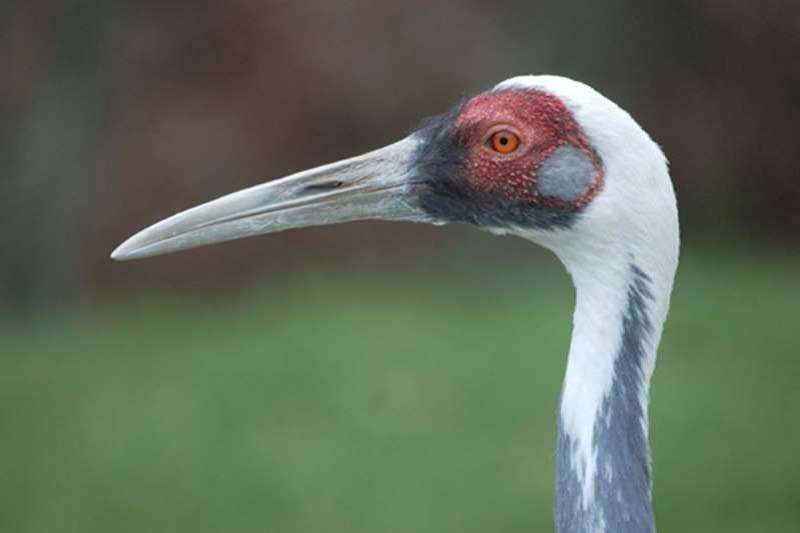 Smithsonian rep Devin Murphy says Crowe has “done really great work with Walnut, getting her to reproduce.” Cranes are one of the most endangered bird species. 11 of the 15 species are endangered, primarily due to wetland habitat loss but also poaching. This decline affects white neck cranes in Asia, as well as whooping cranes here in the U.S.
Walnut is originally from Asia. Her parents were illegally caught in China, but were saved and sent to the International Crane Foundation in Wisconsin. She hatched there. Fast forward to now — after producing several chicks, Walnut is not recommended to breed anymore (unless something happens to the crane population currently living in North American zoos), but her human mate has mastered the art of interspecies wooing. 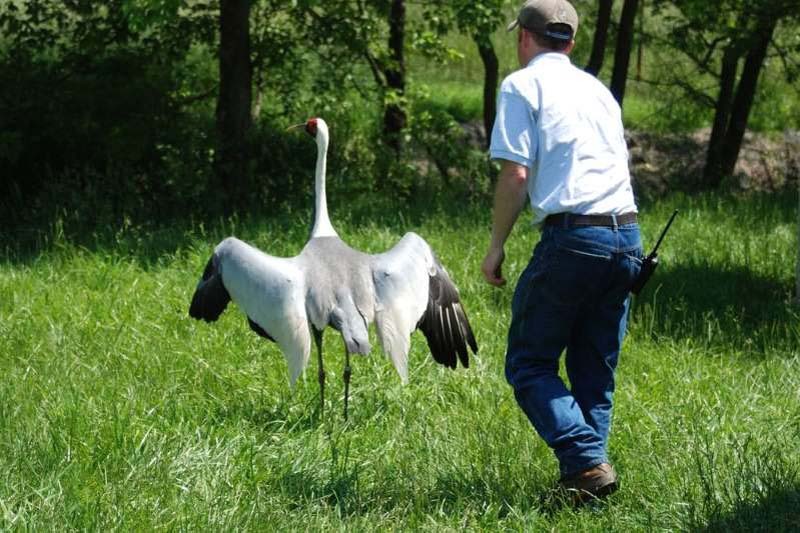 After this courtship phase, Crowe eventually moved on to his artificial insemination efforts, which have helped to increase the endangered crane population. Plus, Walnut is a lot less lonely. Personality or disposition-wise, Crowe describes Walnut as “normally very happy, very exuberant. She dances a lot, calls a lot she’s very curious and alert. She knows everything that’s going on, what’s going on with people or looking up in the sky, seeing an eagle or vulture way up high.” Walnut also keeps herself busy in the yard and nearby stream, typically foraging for crayfish and worms, or the occasional mouse. Crowe says she is “very bold” and will walk right up to people, even though she’s only friendly to him and very unfriendly to everyone else! As Walnut’s designated mate, Crowe is more than just a caretaker, he’s also a life partner. As mentioned, he helps her build her nest — and even watches her eggs. Despite his commitment to Walnut, Crowe is still human and needs breaks himself from time to time. He says that when he goes away for days at a time, he does think she wonders where he is. “Initially, when I would go away on vacation, like for even just three days, when I would come back she would act like she didn’t know me, like she was annoyed, the way a cat sometimes does,” says Crowe. “Now, no matter how long I go away, she’s always happy to see me. But initially I would have to give her some mice and stuff like that, and then she would warm up but now she’s fine.” Sounds like the typical navigation of relationship boundaries to us. Indeed. We have a feeling Walnut would not approve! Though they may seem like an odd couple, Crowe has learned a lot from Walnut, accepting her affections as a way to help conserve this rare avian species. He has since assisted two other female cranes named Amanda and Wucheng’s reproduction efforts, but he remains Walnut’s number one guy. “Some of the other cranes are aggressive to everyone, even me most of the time. Most are just wary, but approachable. But the ones I’ve done artificial insemination with by myself and without physical restraint, they’re much more tolerant of other people. Wucheng seems to be friendly to everybody. Walnut is kind of unique in her strong attachment,” Crowe tells PEOPLE. So, how does this mild mannered and seemingly humble zookeeper feel about being in the limelight as of late? It might seem silly, but the Smithsonian’s progress with Walnut and its other cranes is serious conservation business. “We’ve produced seven chicks from her, so she’s well represented in the captive crane population,” says Crowe. And at least two of her chicks have gone on to pair with other cranes, breed naturally and now have chicks of their own. “I tell people that Walnut and I are grandparents,” laughs Crowe.